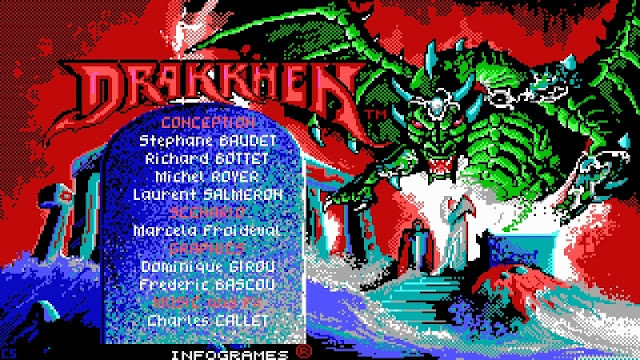 A retro Steam heads up for you all, as we've just found out that the late 1980's and into 90's RPG of Drakkhen will be re-released on Steam on the 8th Feb! If you were a gamer from that era and had an Amiga, Atari ST, PC, SNES, PC-98, FM Towns Marty or Sharp X68000 then at some point you probably came across this game with its massive Dragon like creature with mouth open across the front of the gaming cover. According to the description via the Steam page this game has a visual presentation that combines 3D landscapes and 2D interiors. The player will encounter monsters and fight them in real-time combat, and discover the palaces of the dragon lords. Indoors, the player has to find a way through the maze of chambers, solving puzzles and defeating the minions of the Drakkhen.